Here at Derby Motorhomes, we provide a wide range of motorhome accessories retrofitting services. So, our services includes the supply and fit of most motorhome accessories. Please, ask us more about the products and services we offer. In fact, over the past few years we have made sure that we supply a quality products. Also, developing an after sales service to fit those products, that provides our customers, with piece of mind. Remember, not to forget if you an ASOC (Auto-Sleeper owners club) member, you will receive a 10 % discount on any prices that we quote ( a valid in date membership card must be produced before work starts). Also, we find that the ones that have become popular are those that have integrated the three in one systems. Therefore, with the engine immobiliser, motorhome alarm and tracking system. So, to find out even more about trackers and alarms, please feel free to contact us. In fact, we have a lot of experience when it comes down to fitting tracking systems and alarms. So, if you just need some friendly advice we will be glad to help you. 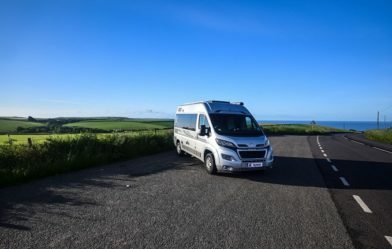 Also, protecting your motorhome is an important part of insuring a motorhome. Some insurance quotes, carry a discount when certain systems are used. In fact, all new Auto-Sleeper motorhomes come with a standard system caller Trackstar. Therefore, any stolen motorhome will be quickly identified. In addition,the Trackstar system, provides customers with peace of mind. Also, there is that element of security in the knowledge, that the Trackstar motorhome system has Thatcham approval and covers against virtually any potential theft. Trackstar has Jaguar, Land Rover, Range Rover and BMW approval. So, when protecting your motorhome from theft in this day and age, being confident in what protects your motorhome helps. Also, this provides insurers, with confidence. Therefore, make sure your motorhome insurance quote has full security details on your proposal. As with any motorhome accessories retrofitting services, we must remain competitive. To that end, we try to use well known products. Also, we find that many alarms have designs to fit most base vehicles like Fiat, Peugeot, Citroen, VW and Mercedes Benz. So, we will be happy to quote you with a suitable motorhome alarm system. Please tell us the make of your motorhome. Please tell us your motorhomes model. Your registration number of the motorhome. Select a date you would like to book the work to be done. Request a service hold down the control key for more than one. Any instructions that are relevant to the work. Upload us an Image if relevant.